So here we are again with another month long blog challenge. I’ve attempted these a couple of times and almost always failed – but this one looks manageable. Created by Tracey over at http://tantrumsandglitter.com/ – the categories she has chosen lend themselves to some different styles of posting – so you can expect to see regular posts, photos and hopefully one or two vlogs thrown in. To get us underway, let’s start with 10 facts about me. Some of these you might know, some might be a surprise. 1. I changed my entire name on my 49th birthday and I wish I’d done it years ago. 2. I love Diet Coke, but can’t drink the full fat version because the sugar in it sets my teeth on edge. I can always tell the difference! 3. I’ve signed up to do The Colour Run in aid of a local hospice, in June this year – although I have no intention of running! 4. I’m a (lapsed) member of MENSA – my IQ is just one mark lower than Stephen Hawking’s. 5. I pretty much drowned when I was about six. I completely blacked out in the water and had to be dragged out and I assume, rescucitated. This has left me with a lasting fear of water. I can swim, but I rarely do. 6. My favourite colour is purple. I’ve had purple hair previously and probably will again. 7. I am ridiculously, embarrassingly competitive. If I can’t be the absolute best at something, I have no interest in taking part. If you know me in real life you probably have a cringe worthy story about me being over the top competitive and making an utter arse of myself. Do me a favour and ssshhhhhh. 8. I won a plus sized beauty contest in 1994. It was kind of televised, and my mum (who I was estranged from at the time) told my aunt that she was so ashamed, she didn’t leave the house for a week afterwards. That made my day! 9. I’m more than a little obsessed with Rocky Horror Picture Show – I have a tattoo with a quote from the show on my wrist, and I intend to get more. 10. I’m a very impulsive person. Before now, I’ve woken up and said “I feel like a new tattoo” and actually that day came home with two new ones. And just this week I arranged to buy a car completely out of the blue! 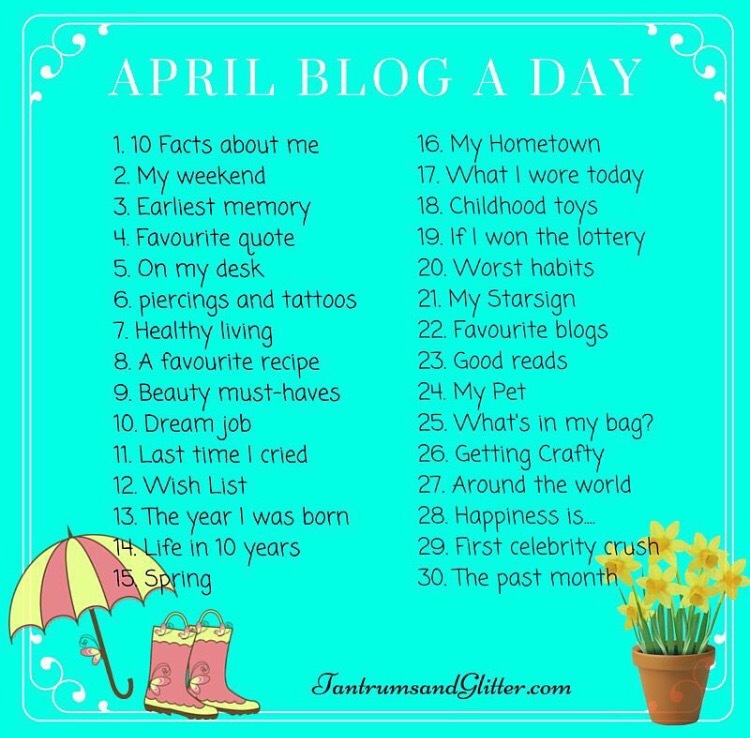 Who else is taking part in #AprilBlogADay ? Let me know so I can link you up and don’t forget to check back every day to see how long it takes me to fall on my face with my efforts. I’m taking part too. I’m loving your facts, though was really surprised by your competitive nature as you always seems so chilled. Also you made me realise another fact about myself, I have never seen the Rocky Horror Show. PS Can’t wait to see you in a couple of weeks. Thanks! The Colour Run will definitely be a Colour Stroll in my case! And Rocky Horror will be coming to a theatre near you at some point this year, I’m sure – awesome night out!